The Microlite74 2.0 Special Edition is a 60-page PDF designed to be printed in booklet format from Adobe Acrobat. Like the digest-sized version of Microlite74 1.1, the artwork is by Håkan Ackegård. (Visit Håkan Ackegård’s Fantasy Gallery on the web at http://ackegard.com/ to see more of Håkan Ackegård’s fantastic art.) Unlike that first attempt at a digest-sized edition, the pages in this edition are numbered and there is a table of contents. 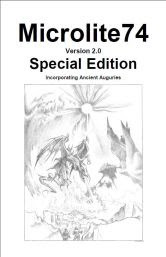 This Special Edition incorporates the rules from the first supplement, giving you the main Microlite74 rules and the optional rules from the first supplement in one booklet. The text has been reformatted in a single column in a large enough font to easily read. To get access to a download of Microlite74 2.0 Special Edition (as well as other special RetroRoleplaying Cancer Fund downloads), send a donation in any amount — small or large — to me via Paypal. My apologies for having to ask for donations and my heartfelt thanks to everyone who donates. If you cannot donate but wish to help, please spread the word about my request and offer. Thank you very much in advance.